One of the most popular tourist attractions in the capital city of Prague lies in the middle of the city. The Old Town Square is home to the famous Astronomical Clock. Not only is it popular because of its beauty, but also because of the entertaining hourly show it provides. This ornate clock known as Orloj, dates back to the 15th century and was mounted on to the Old Town City Hall. It was almost destroyed by the Nazis during the Second World War but underwent extensive repairs in 1948. 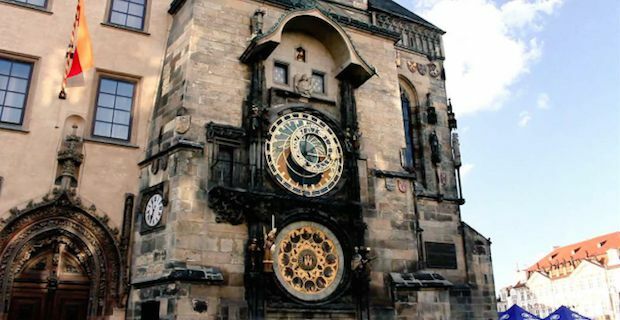 It consists of 2 dials, the astronomical dial and the calendar dial, with the former now being a main symbol of Prague. There are also 12 medallions with zodiac signs that were added by Josef Manes in 1865. Every hour spectators can enjoy a short spectacle of Christ appearing through a window followed by the 12 apostles. The skeleton of death also comes out reminding us of the frailty of life along with vanity looking into a mirror displaying our human quality. The performance is concluded with a cockcrow. Today is a special day though as it celebrates its 605th birthday and is the oldest working clock of its kind in the world. In celebration of the important day, Google marked the occasion with a Google Doodle that can be seen throughout most of Europe, Australia and parts of East Asia and Africa.